Was happy to finally see this. I had never gotten around to viewing it and so I was excited to hear that Twilight Time was releasing this classic 1960’s Melodrama romance on a new Blu-ray. A mix of comedy and dramatic appeal. It’s always a treat and a 100 percent beauty to experience a film for the first time on a high-quality product, lovingly brought out by Twilight Time. The plot is very simple your introduced to a couple in France. It’s about there rocky and troubled relationship throughout the years. The ups and downs of life, infidelity, and ultimate drama that comes with marriage. A wonderful all-star cast. Two of the greats in cinema history. The amazing, flawless one of a kind Albert Finney. He is one of the all-time great performers in cinema. His vast array of characters stand out above and beyond mere words in a review setting. Started acting in 1956 and did so up to 2012. Starring in such classics as 1963’s Tom Jones, 1963’s The Victors. His amazing performance as one of my favorite sleuths of all time, Hercule Poirot in Agatha Christie’s Murder on the Orient Express (1974). Loved him in one of my all-time favorite underrated horror films, the amazing 1981’s Whitley Strieber’s Wolfen. But who can forget the one and only true musical, Anne, playing Daddy Warbucks in the 1982 film, which is a personal favorite of mine. There is so many greats and Two for the Road is one of those greats. Now it comes to the main female lead. The amazing, beautiful, stunning, masterpiece worthy goddess of cinema, I speak of the one and only Audrey Hepburn. She needs no introduction. Her many greats of cinema are some of the greatest films ever created. One of my favorite musicals of all time 1964’s My Fair Lady. Truman Capote's Amazing Breakfast at Tiffany’s, which is one of the best characters of all time, Holly Golightly. 1953’s Roman Holiday, 1954’s Sabrina, 1956’s War and Peace, 1961’s The Children’s Hour, 1963’s Charade, and one of my personal favorites 1967’s Wait Until Dark. I could go on and on but the point is for only acting in 33 performances in her career, she left an amazing array of Masterpiece worthy characters, and films that still shine today. 63 years was way too soon to leave us. 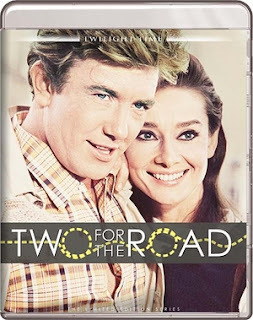 But there are her films, her beauty on screen shines, and the character of Joanna Wallace in Two for the Road is another prime example of that beauty and wonder that she was about. Audrey Hepburn and Albert Finney play off each other wonderful. Both their characters come to life and create a memorable reality to the viewer. Directed by the one and only Stanley Donen. He is a director that I often return to, to repeatedly experience his films, for it is a total delight and wonderment in themselves that leave a lasting stamp upon the you. So many of his films are memories inside my movie loving brain. 1952’s Singin’ in the Rain, 1954’s Seven Brides for Seven Brothers, 1957’s Funny Face, 1963’s Charade. You get my point. What is so shocking about his reality is that he not only had his wonderful hits, but he also had some bad misses. He was a director that went up, and went down. From high class cinema, to B-movie cinema, for instance 1980’s Sci-fi Horror Saturn 3 (which if you know my reviews I constantly mention my love and collecting reality of B-movies, and Saturn 3 is one of those great B-grade flicks). As I have stated this is a wonderful comedy drama. It’s a British comedy that stands out. It’s very memorable. I think the two realities that stand out the most is the amazing cinematography by Christopher Challis. His rich beauty is amazingly apparent throughout. The other reality is the odd and very experimental nature the movie is filmed in. You are given ends of the story first, and moments of the story are pieced together like a jig saw puzzle. In today’s movie world, this is all too common, but for the time period, watching a film told through flashbacks, or already seeing a result, and then ultimately leading up to what happened was a pioneering reality. This film was nominated for many awards. Nominated for best writing at the 1968’s Academy Awards. Nominated for a Bafta Award, Directors Guild of America Award, Golden Globe award for Best Motion Picture and best original score. Also, won many awards like the 1968 Cinema Writers Circle Award, 67’s San Sebastian International Film Festival Golden Seashell, 67’s Writers Guild of Great Britain Merit Scroll for Best British Comedy and 67’s Writers Guild of Great Britain Merit Scroll for Best British Original Screenplay. This was a solid choice for Twilight Time to bring out. Truly one of those that deserved a Blu-ray treatment and thankfully Twilight Time decided to do that. Another flawless example of how to treat a film. Beautiful transfer to high definition 1080p. The video is vibrant. The sound is crisp and quality to the ears. Another brilliant example of a Blu-ray product by Twilight Time. Isolated Music Track: The all-important extra that most of these releases come with. The isolated score is something I always look forward to, mainly because I am a music fiend, but also, I love film scores. The music to this film is amazing. It’s done flawlessly by master musician Henry Mancini. A composer close to 200 features. His work used on over 340 soundtracks even still used to day as of 2016. He passed away in 1994 but left a world of beauty in musical sound. Started working on films at the beginning of the 1950’s. Henry Mancini is a guru of music. He was a true treat to listen to. He composed so much in the music world. Working on such greats like 1958’s Touch of Evil, 1961’s Breakfast at Tiffany’s, 1963’s The Pink Panther, 1963’s Charade, 1967’s Wait Until Dark, 1962’s amazing Experiment in Terror, 1962’s Hatari! and some of my personal favorites, 1985’s Lifeforce, 1985’s Santa Clause, 1986’s The Great Mouse Detective, and countless others. He was a true musician that left the world with a sound of beauty. He worked on one of my all-time favorite Sci-fi Drive-In films 1957’s The Monolith Monsters. Audio Commentary with Film Historians Julie Kirgo and Nick Redman: An awesome commentary. Two very gifted and knowledgeable film historians. I am a huge fan of Julia Kirgo and Nick Redman. Both are true cinema loving masters. I enjoy hearing from great film historians and Kirgo and Redman are two of them. Another priceless commentary. Audio Commentary with Director Stanley Donen: Truly a brilliant listen. One thing that is always very important to me is listening to those who created the film. This was an amazing listen, hearing the director himself talk about the production, and the actors, and the trip down memory lane. A priceless commentary. Twilight Time has done it again bringing an old, priceless classic to a new transfer. A lovely Blu-ray that is a golden ticket of perfection in experiencing this amazing film. I really loved being able to experience this film for the first time on an amazing high quality production of a product. Twilight Time never fails in expressing great cinema on lovely high end Blu-ray’s. Highly recommended.